First: great movie, literally awesome visuals, stunning effects, good acting and execution, fun alien creatures, who cares if it’s a retelling of Pocahontas. What I absolutely did not expect when I finally got to see James Cameron’s ‘Avatar’ yesterday afternoon was to see my own research appear in the movie. Granted, it doesn’t take a front-row seat and it doesn’t play any major plot roles. As I was driving home with my girlfriend (a fellow aerospace engineer), we got into a discussion about how this was a reasonably hard sci-fi movie. None of the technologies seem particularly farfetched: ducted-fan helicopters exist on Earth at a low technology readiness level (TRL), as do exoskeleton power suits. 3D glassy computer displays aren’t a stretch, nor are hovering VTOL aircraft on a low-gravity world. The flight to Alpha Centauri takes 6 years, meaning some reasonable sort of sublight propulsion. The ship Sully arrives on even has rotating segments, big radiators, and solar collectors. The avatars themselves don’t even seem too crazy, since we keep hearing about advanced prostheses that can be controlled by a user’s thoughts. (I’ll reserve judgment on mixing alien and human DNA until we have real alien DNA on hand.) Nor does a planetwide neural interface – though I have to wonder what selective pressures would cause such a thing to evolve – given that we have bacterial, fungal, and other life forms on Earth that can split and recombine, blurring the distinction between organisms. But surely, I thought, those floating mountains are ridiculous. Visually stunning, yes, and great for those 3D flying scenes. But physically ludicrous. We are led to believe, in the movie, that these mountains float against the force of (albeit reduced) gravity because there is an exceptionally strong magnetic field generated on Pandora. Cameron even gives us direct evidence of that field: you know how iron filings align themselves with a magnetic field, like that of a bar magnet? A field that bends rock to its will! I know for experience that this might not necessarily be impossible, for a sufficiently strong magnetic field. After all, in my lab is a whopping-big NdFeB rare-Earth magnet about the size of a margarine tub, and even when it’s contained within its sarcophagal wooden box, I can get six-inch steel bolts to suspend themselves, against gravity, at a 45° angle in its field. So, for a sufficiently strong magnetic field, this flux-line rock formation is not at all out of the question, believe it or not! How about the mountains themselves? Couldn’t the magnetic field strong enough to make these “flux arches” also levitate mountain-sized chunks of rock? Well, I thought, surely not if it is solely the repulsion of like magnetic poles that is responsible. After all, Earnshaw’s theorem says that the familiar field sources that drop off with distance, like gravity, electrostatic attraction, and magnetostatic attraction, cannot be arranged in a passively stable configuration. If you don’t believe me, then I set for you a challenge: get some ordinary bar magnets, and lay them out on a table. Try to arrange them in such a way that they are within a few centimeters of each other, but the attraction of opposite poles and repulsion of similar poles cancel out so that the entire arrangement sits on the table without moving. (For safety’s sake, do not do this with the rare-earth magnets I mentioned above, because when you fail at the challenge, the magnets will jump towards each other with substantial force. Rare-earth magnets are brittle and will shatter if that happens, sending neodymium shrapnel flying around – if they didn’t pinch your fingers when they impacted.) You will find that no matter how hard you try, no matter how many friends you get to hold the magnets in position and simultaneously release them, no matter how you angle them and tweak them, you won’t ever be able to prevent at least one of the magnets from attracting or repelling some other magnet. The whole arrangement will either fly apart or collapse together. You might think that in 3D you’d be able to come up with some super-clever configuration that is stable, but, in fact, if you move beyond the two dimensions (and three degrees of freedom) of the table top the situation gets far worse, because all the bar magnets try to align themselves with one another in 3D. So, a combination of purely magnetic and gravitational forces cannot result in a stable configuration of those mountains. The key difference between a Levitron or an orbit and the bar magnets on a table top are that they are dynamically stable. They require motion to preserve stability. Stop the planets from orbiting, and they will fall into each other and the Sun. Stop the Levitron from spinning, and it flops over – aligning itself with the magnet in the base – and drops to the ground. So, for Pandora’s mountains to levitate like that, they must be spinning or moving in some way. It might be the case that, if they were at Pandora’s equator, the repulsive magnetic force actually “cancels out” the low gravity of the moon enough that the mountains are actually in circular orbits about Pandora’s equator. But that situation is dynamically tricky, requiring exquisite balances of forces – and I would estimate from the different sizes of floating mountains that they have different magnetic mineral contents, so the balance between gravity and magnetism would be different for each mountain and each would have a different orbit. Doesn’t work. So what’s the answer? Well, it’s all in those little gray crystals the imperialist human colonists of RDA are after. Unobtainium. An unobtainium crystal, unobtrusively levitating. Wait, what? Above is a picture of an unobtainium crystal from the movie. It’s levitating above some crazy sci-fi antigravity contraption, that holds it stably up in the air where people can poke at it, spin it, pluck it out of midair and play with it before putting it back in exactly the same spot again. Now, wait a minute – where have I seen this behavior before? Oh, right. My research lab. That is a picture I took of a NdFeB magnet, stably levitating over the high-temperature superconductor yttrium barium copper oxide, or YBCO. (For scale, the magnet is 3/4″ across.) You can do everything with that magnet that they do with the sample of unobtainium in ‘Avatar.’ Leave it alone, and it happily floats in midair. Poke it, and it rocks a little before going back to its equilibrium position. Give it a twirl, and it’ll spin over the YBCO – and if the magnet isn’t cylindrically symmetric, it’ll eventually stop spinning and settle down again. Pull it away from the YBCO, and you can put it back later and watch it float in exactly the same midair spot as when it started. You can even pin different sizes and shapes of magnets – all stable against gravity. This whole setup would work perfectly if the magnet was on the table and the YBCO was doing all the floating, too. It’s all because the magnet induces currents in the YBCO that are not opposed by any resistance – “supercurrents” – which generate their own magnetic fields that then interact with the magnet. That would be an astute question. The answer is that, in this case, the superconductor doesn’t have a fixed magnetic field. As the magnet moves around – let’s say it starts to fall from its equilibrium position, because gravity is pulling on it – then its motion causes the supercurrents in the YBCO to move around. The new distribution of supercurrents gets superimposed on top of the previous distribution of supercurrents, with the net result that the magnetic field from the YBCO tends to push back on the magnet, keeping it in its original position. It’s as if the field lines of the magnet get stuck, or trapped, in the volume of the superconductor. The effect is called “magnetic flux pinning” for that very reason, and it happens with Type II, or “high-temperature” superconductors. (If you know about Meissner repulsion, flux pinning is related but not the same.) So, that blue-glowing antigravity generator in the RDA command center, with the levitating sample of unobtainium, is very likely just a magnet. And the Hallelujah Mountains are just a scaled-up version of the magnet and YBCO in my lab. But, you probably noticed from that photo, the YBCO has to be below liquid nitrogen temperature in order to superconduct and exhibit flux pinning. Clearly, Pandora is not at cryogenic temperatures, which pretty much pegs “unobtainium” as a room-temperature superconductor – a type of material that is highly sought-after in research labs today, and would indeed be extremely valuable. That means that the Hallelujah Mountains on Pandora likely consist of large deposits of unobtainium, which are flux-pinned to the stupendously powerful magnetic field lines coming from that field sources on the planet. This explains the value of unobtainium, how the mountains levitate the way they do, and why the floating mountains are so close to the flux arch structures. There’s another interesting link between ‘Avatar’ and flux pinning. Remember how I said that the effect of flux pinning is as if a magnet’s field lines get stuck within the superconductor? 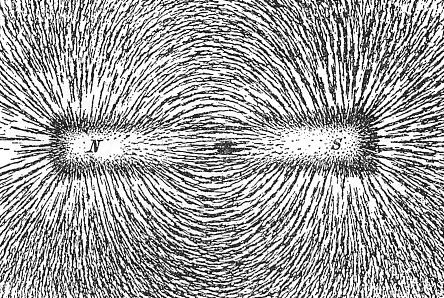 Well, if you had a good electricity and magnetism course, that notion might sit uncomfortably with you, because you were probably taught that “field lines” or “flux lines” are not physically real, but are a good visualization tool for magnetic fields, which exist everywhere around a magnet and not just in neat little looping lines. Well, you’d be right, but things tend to get kind of weird inside superconductors. Magnetic fields are quantized just like everything else, and it is these magnetic flux quanta that get “stuck” inside the YBCO. In fact, they actually get trapped on impurities within the YBCO’s crystal structure. You might think that these quanta of magnetic flux would be called “fluxons,” but because they correspond pretty well to magnetic field lines, papers on superconductivity and flux pinning tend to throw around several names for them – like “flux lines,” “field lines,” and “flux vortices.” That last name likely comes from the fact that, in the superconductor, each of the magnetic field lines induces a little loop of electric current that races in a circle around the flux line, like a little vortex. The sum total of all these little currents adds up to the distribution of supercurrents that gives us flux pinning. In ‘Avatar,’ every time they fly near the flux-arch structure, they talk about a “flux vortex.” It sounds like your classic sci-fi trope of combining sciency-sounding words. (“Invert the phase capacitors!”) But, hmm…maybe, just maybe, that’s not mere technobulshytt after all! Oh, well. But, speaking as someone who hopes that our future space program will involve spacecraft build out of components that “levitate” near each other without touching, but still acting as if they are mechanically connected, I would sure love to see some room-temperature superconductors and floating mountains! This entry was posted in Movies, Research, Science, Science Fiction. Bookmark the permalink. Very cool, had no idea that Avatar had sci fi elements. I was unfamiliar with the term unobtainium, so I actually thought it was hinting at the lack of sci-fi in Avatar. That makes me like the movie even more, I was happy with it being a beautifully rendered fantasy movie. Like the anathem reference! Thank you for this article! I was having a… “discussion” with my husband on the way home from Avatar about whether or not the floating mountains might be possible. I said it might be possible (although I had no idea how), and he said it was completely ridiculous. Clearly, I win. 😀 Also, your research sounds awesome. Thanks! But I wouldn’t start gloating too much. I may have put my finger on a possible physical mechanism for the floating mountains, but I have to say that the magnetic field requirements to get that to happen would indeed be “completely ridiculous.” So I guess you both win! I clearly do not have your expertise in physics, but I respect all your comments though I lack the knowledge to appreciate them. From the movie it makes sense to imply that the levitating rocks are not just levitating randomly on the planet. They are levitating in specific areas (the Na’vi shrine for example) were specific geophysical conditions arise. In addition the RDA executive in the picture you have above clearly shows Unobtainium levitating on top of a circular object and NOT anywhere in the room. So, I am intuitively seduced by your flux pinning theory. Regarding the feasibility or practical existence of room temperature supraconductor, as as humans we have been wrong before in predicting what is or is not possible in mother nature, even in the light of very strong evidence that something was either impossible or very very unlikely: it took 10,000 years of civilization to figure out that light speed is finite. Regarding the mind boggling powerful magnetic field, is it possible to imagine that unobtainium actually has the capability of multiplying the effect of a magnetic field inside the rocks thus not requiring a great intensity of the external field since it is exponentially amplified inside the levitating rock? Regarding the arched rocks it might be possible even with a low magnetic field, considering it might have taken thousands of years for the rocks to reach that configuration. They might be like live crystals that actually grow very very slowly, etc, etc. With some imagination all this can be set to even make some sense. Once the idea of magnetic field amplification inside the rock or amplification of the levitating effect caused by a magnetic field inside the rock is considered, then it can be understood why the equipment (the aircraft, armor suits, guns, etc) is not strongly affected. Anyway, the movie is fantastic, and thanks for sharing your awesome research with us non initiates, looks really cool. Thanks for the comments. On this blog, I try to be as accessible as I can in my discussions of physics without getting into the esoteric or specific arguments. Glad you followed along! So far as I know, there is no principle of physics suggesting that a room-temperature superconductor would be impossible. In the history of superconductor research, we’ve started with materials that superconduct at liquid helium temperatures (~4 Kelvin), then the development of “high temperature” superconductors that work just below liquid nitrogen temperatures (77 K), and now there are some materials that are pushing 120 or 150 K. Room temperature is still a ways away (~290 K), but it’s probably not impossible! As you said with the example of the speed of light, with better and better observations and experiments, scientists get closer to the finer details of physics, and superconductivity – specifically, what crystal structures best promote it at high temperatures – is a relatively young area of research, so we may yet find or create unobtanium! This is some excellent commentary. It’s refreshing when a film, such as Avatar, goes to the lengths it does to remain scientifically plausible even when breaching the current limits of human understanding in particular areas. I was wondering, however, if it’s possible that Polyphemus, the gas giant of which Pandora is a moon, could have a compounding effect with the “flux vortices” to help explain the Hallelujah Mountains. Could its mere size in proportion to Pandora have a counteracting gravitational effect on the unobtanium laced mountains? Perhaps it has a strong magnetic field of its own? The issue of gravitational interactions between a planet and a moon is quite complex. Certainly the giant planet would pull a bit on the floating mountains, but it probably wouldn’t pull hard enough to overcome Pandora’s own gravity. There’s a concept in planetary studies called the “Roche Limit.” That is the orbital radius at which, if a moon is any closer in to the planet it orbits, tidal forces from the planet will rip apart the moon into little chunks, turning it into rings like Saturn’s. Outside that limit, tidal forces from the planet may deform the moon (just like tides from Earth’s Moon deform the shape of our oceans), but the moon’s self-gravity is enough to hold it together. So, if Pandora’s floating mountains were a result of the gravitational pull from Polyphemus, that would be a sign that Pandora is dangerously close to the gas giant’s Roche Limit and is starting to get ripped apart! If Pandora was at that point, I’d expect the Na’vi climbing up the Hallejuah Mountains to also drift up from Pandora’s surface if they let go of their hold on the mountain! There’s also the issue of where on Pandora the mountains are. I’m not sure if Pandora is tidally locked to Polyphemus (with one side of the moon always facing the planet – like our Moon), but if it’s not, then the site(s) with the mountains would see Polyphemus rise and set again and again. THAT might have a distinct gravitational effect on the mountains, as gravity would periodically push and pull on the floating mountains. It might get the mountains slowly oscillating, or might destabilize them and cause them to crash into each other or Pandora’s surface. If unobtainium is actually a room-temperature superconductor — presumably one with a complex construction such that it is cheaper to mine from Pandora than synthesize in bulk on Earth — perhaps the near-surface magnetic field source causing the rock arches is actually current loops in appropriately shaped unobtainium deposits. After all, superconductors are magnets, too, right? The original current source could have been motion through Pandora’s planetary magnetic field, caused by a minor earthquake or by tidal forces from Polyphemus. The deposits would have to be topologically toroid, that is, have a hole in them somewhere. That explains strong fields near the surface, which could then contribute to the levitation of the mountains of unobtainium by field pinning. But that still doesn’t explain how the metallic military technology can operate in the region — or how organisms can move around without being affected by the diamagnetism of water. YorgZ’s proposal of a (hitherto-unknown in nature) magnetic amplification effect in the Pandora rocks seems the simplest way to make it all add up. Crucially, the amplification effect needs to occur only in the core of the rock arch/mountain, otherwise organisms on the surface would experience the high magnetic fields. So something like superparamagnetism wouldn’t work unless you could explain the shielding of the magnetic force outside of the ring arch/floating mountain. Well, a superconductor is only a magnet if it has an embedded supercurrent. That is possible, and it’s not even necessary for the superconductor to be toroidal. However, Maxwell’s equations tell us that it’s dB/dt (or dH/dt) that induces this current, and if the superconductor ever stops moving through the field, the induced current will drop to zero. So unless the supercurrent comes from motion through Prometheus’ magnetosphere, you have to embed that supercurrent through other means (such as field-cooling). I’m not sure what effect would result if the superconductor forms in a magnetic field! Of course, Cameron himself has said that the floating mountains came from an image that came out of a dream he had (this interview, in the question starting around 19:00), rather than any basis in hard science, and they are a beautiful image in that regard! Maybe the trees/vines atached to the rocks act as a sorce of electricity? I mean it’s like a circuit board. Why can’t the magnetisum be increased by that elec? Also it’s set much further in the future in a galaxy that may not have the same physical laws that we do. The Q we should be trying to answer is. How were they able to travel to another life filled planet? If it’s 4.35 light years to the nearest star system? Have they harnessed faster than light travel? Or worm holes? Pandora is supposedly located in the Alpha Centauri star system – the closest star to the Sun – and perhaps only a hundred years from now. They planet would obey the same physical laws we have here on Earth, just like any galaxy in the known Universe. And humans could reach that star system using conventional rocket propulsion, albeit a lot of it for a very long time! If any of you read “Avatar: A Confidential Report on the Biological and Social History of Pandora” it’s got a brief blurb with pretty much your exact explanation. with a history of how the flux lines are pinned to the unobtanium. IIRC all unobtanium on Pandora is flux pinned. That might be why it’s worth mining not manufacturing. Oh and apparently it has five-fold crystal symmetry which I thought was impossible..? The important question is would this unobtanium become flux pinned near earths magnetic field??? How would we use it?? I’ll defer to you on that one. I find it ridiculous that they were using manned gunship and manned mechs. The neck radios they wore and the avatar mind link communication worked flawlessly despite the vortex so why would they compromise the performance of their machines by including space for people and risk those peoples lives when it could all be controlled back at base, wont UAVs be advanced by then? The most stupid thing is all the exposed gunners everywhere .Behind the door on the little helicopters and all over the top of the big one. They cant control those guns remotely behind a screen like we are starting to do today? They have to have exposed people?They hae amazing 3d displays. Why would the aliens use wood arrows when they could use those carbon fiber animal bones? The humans can make an avatar hybrid but not an antidote for the neurotoxin? Lastly What kind of muscle energy would it take for a predator to kill an animal with thick but light carbon fiber armor? I’ll leave that one to you also. oh i forgot what are the guerrillas going to do if the humans come back with nukes? Lets hope they dont. Wouldn’t the magnetic fields be so strong that human as well as Na’vi brains would be fried? But well, at least the Cat People have the justification of being able to defy the laws of biology, since they have blue pigments even though Alpha Centauri seems to emit light of the same spectrum as the Sun, have two eyes even though all other shown vertebrates have four and live in an environment where predators evolved the ability to get hijacked by their prey. It’s exhilarating to once and for all find someone who actually knows what they are talking about. Honestly, with as much info as there is floating around on the internet, TV, radio, and magazines, it is hard to know what to believe nowadays. I’m glad to know I am not the only dude who thinks this way. Wanted to thank you for an insightful article on the subject. The comments were pretty insightful too, never imagined that some people would miss all of the sci-fi elements in what is a clearly sci-fi film. Just a quick note on the stone arches – they and their surroundings point to formation by erosion, likely they formed quite a long time ago, as igneous rock. The surrounding formations of weaker rock were weathered and eroded away, over what I imagine is a considerable period of time, resulting in arches remaining in place – notice a lot of them broke under their own immense weight, and only some remained once exposed. Monument Valley is a good example of the result the same process here on Earth. The rock arches found on Earth, though, have shapes and orientations dictated by the erosion forces of wind and water. On Pandora, what I am suggesting is that another force enters the mix: magnetism, which predisposes the orientations and shapes of the arches. In addition, magnetism helps support the arches against the planet’s gravity, since their shapes don’t match what we see on Earth where magnetism isn’t important in this process compared to gravity. Your suggestion that the base rock was originally igneous is a good one, and might explain how magnetism came to have such a great effect. As the rocks cooled from magma, the crystal structure would naturally align with the magnetic field. This process could potentially lend more tensile strength to the rocks according to the direction of the field, and so when they erode, they might be left as freestanding arches in the shape of the magnetic field. First, thanks for this extremely insightful article that helped clear up a few questions I had surrounding the topic of magnetism. I might not have cared for the movie itself, but this was a fascinating and informative read all the same. However, I do have a few more questions about magnetism that I’m curious about that I’d love to have answered. Firstly, is our earth’s magnetic field stronger nearer the core (as isn’t that where it emanates from)? Thus, could such floating mountains as seen in Avatar exist within hypothetical caverns lets say, within the mantle as opposed to on the surface? However, I thought higher temperatures prevented strong magnetic forces from ‘occurring’ (if that’s the right word to use); I’m not sure if I’m remembering this correctly or not. Also, how much stronger could the earths magnetic field viably ever be and what effect would this have on the surface and in particular on living organisms? Finally could you possibly explain the term ‘planetary dynamo’ a bit more? Thanks. As it seems, the magnetic field for the mountains is strong enough to take down ISV Venture Star’s systems when it’s halfway to Pandora. And do weird stuff all the way to Earth. I mean, we’re talking millions of teslas here (magneticSI: 1 tesla wipes all credit cards from the Sun, kills everyone from the Moon). Hi, I figured all this out a long time ago. The “missing” information is that PdHS with nano-sized sulfur particles of a very *very* specific size (31+/- 0.2nm) absorbs hydrogen from the air and then superconducts. Ironically this also proves that H3S working at high pressure is the same effect, I’m in the process of trying to find out if the original observation circa 1976 was actually the same effect from impurities in the Pd from only one source. It appears that this only happens at a specific combination of pressure and temperature, it has to start off at 1800K under bone-crushing pressure then slowly cooled probably over several days while in an oxygen depleted hydrogen atmosphere which is basically the opposite of how YBCO and other cuprates are made. In fact any oxygen in the mix causes the reaction to stop. Pd isn’t usually found in nature in its native form but on an alien planet it may well be. Also explains how Pandora’s atmosphere is unbreathable, nowhere near enough oxygen and probably other nasties such as free Cl and F.